Yesterday the presidents of all the Continental Associations of Bishops’ Conferences released a statement calling on world leaders to limit global temperature increase and protect vulnerable communities from climate change. We hear firsthand from the Prime Minister of Pacific Island Tuvalu – one of the places most impacted by climate change – on how extreme weather is affecting his community and what must be agreed at the Paris climate talks in December. If there is one country that is right on the front line of climate change, it is Tuvalu. Our Pacific Island nation has only 26 square kilometres of dry land, none of it more than four metres above sea level. Most of the 12,000 population live less than two metres above sea level. When Cyclone Pam – a maximum category 5 storm – hit us in March this year, we had waves up to five metres high. Crops were ruined, livestock swept away and an enormous amount of infrastructure, including a hospital, was destroyed. Nearly half of our people suffered losses, and we are only beginning to recover. We continue to seek support from the international community to rebuild. It is clear. The science tells us that these severe events are caused by human interference with the climate. As Pope Francis wrote in his recent encyclical, “Climate change is a global problem, with grave implications.” We, in low-lying island states such as Tuvalu, are the first to feel the effects, and have the most to gain or lose from the new international climate change agreement to be concluded in Paris at the end of the year. 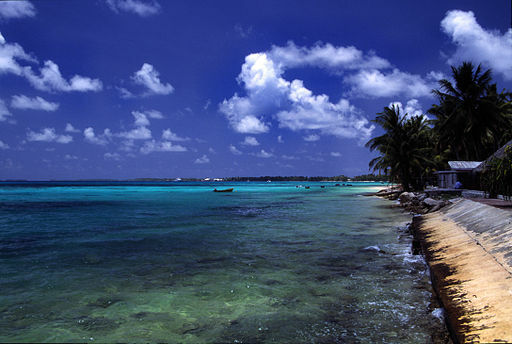 Beautiful Tuvalu is at great risk from the effects of climate change. Photo by Stefan Lins. The Paris Agreement, which we believe should be a new protocol under the UN Framework Convention on Climate Change, must deliver real and substantial commitments from all nations to address climate change. Everyone must do their utmost to reduce the production of greenhouse gases and help those suffering the impacts of climate change. We must not hide behind self-centred conservative politics and self-centred climate-denying media, particularly in the United States. Whenever I visit the US I am totally dismayed at the amount of climate change denial in mainstream media, particularly on Fox News. They seem to be operating on a different planet to our own, and we can no longer afford to listen to them. Although we are most severely affected, the problem is not of our own making. It is the global polluters who must respond. In the Paris Agreement we are seeking a legal mechanism to address loss and damage caused by climate change. We know that countries here in Europe and the legislature in the United States are opposed to such an arrangement. I put it to those countries – if you faced huge economic losses, the displacement of populations and perhaps the loss of territory, wouldn’t you be seeking some sort of redress? But Tuvalu does not believe that carbon trading is the answer. Not only is it more about shifting responsibility than it is about reducing emissions, we believe it will merely feed corruption and misappropriation of funds. Unless we address the drivers of deforestation, we will not address deforestation. Cyclone Pam taught us a huge lesson. We cannot rely on the aid community to deliver the necessary support to help us rebuild from the impacts of climate change. We need a proper, legally binding regime to ensure that we can increase our resilience, survive and prosper. Without that, there is no point in talking about sustainable development strategies, or formulas for economic growth on the islands. The Paris conference must come out with a global pact to save, not the economies and lifestyles of the rich, but humanity itself. Next Next post: Step into the Gap – Welcome to the new CAFOD gap year volunteers!